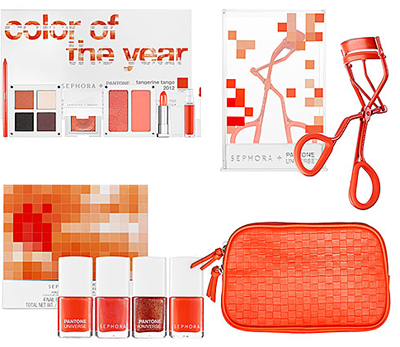 Pantone, the color matching system used by the printing, textile and plastics industries, has teamed up with Sephora to put out a line of products in this year's official color, Tangerine Tango. (Thanks for the tip, Kayla.) I'm all for orange! I wouldn't be caught dead in orange lipstick, but my toes wouldn't mind some tangerine polish. I'm amazed by the relentless supply of licensed merchandise Pantone has been cranking out in recent years. Socks, chairs, contact lens cases, cuff links, toothbrushes, eye glasses, Christmas ornaments, Visa cards, and more. Does the world really need official Pantone false eyelashes? Sure, why not. An interesting note: after I posted this Pantone chip craft project, I quickly received an email from Pantone’s Licensing and Trademark Department stating that they need to protect their licensees and intellectual property, and if I desire to extend the use of their intellectual property for commercial purposes, I should contact them to learn about current licensing terms. Apparently the licensing folks at Pantone keep very busy making deals with manufacturers and combing the internet for home crafters using old Pantone chips. I'm tempted to put a set of magnets up for sale and see if I get a cease and desist letter. Aw, let them have some fun... do it! And for the record, I kind of love the eyelash curler. did you see this today? I found it via Apt.Therapy. I did see that! Janine at Salvage Love sent over her photos and a link. So fun! Also. I kind of love the eyelash curler, too. No plans to ever use one, but still. If you're going to own one, it may as well be orange and awesome. I am an orange lover too. I was so happy when tangerine tango was the color of the year! I MUST have that eyelash curler even though they are obviously jerks. They're just doing their job. Still, it made me chuckle a bit. I NEED some of those eyelashes... with the little feathers to tickle my cheeks... or to tempt my cats! Fun!!! Your kitties would love them. Great idea. I've recently found out there's even a Pantone hotel in Bruxelles (Belgium)! yes please to all this orange!!! And did you say "Bite me!"? I mean, r-e-a-l-l-y, most home crafters are using the chips for personal use, not as a commercial venture. What? They don't make enough money selling their exorbitantly priced color books? Chip users UNITE! as mrs Coco Chanel said about copies: only makes me proud - shows that i have reached success in what i do. I dont remember the exact words but anyhow, im sure you get my point. I'm pretty sure recycling for personal home craft use is not a licensing infringement. How strange! Maybe if you were selling them, they would have a leg to stand on, although a very shaky leg. And let's not forget Barbie Pink Pantone! I've just been drooling over the Pantone display of merchandise at my local bookstore, but some of the bloom is off after reading your story. Really, Pantone? This is stunning! An amazing selection and a great idea. Thanks for sharing! Have you seen that amazing Pantone Sweets art that is floating around the web? So pretty! I love love orange lipstick. I'm crazy about orange. I'm glad that there are a lot of orange stuff out right now (It's usually hard find an orange-colored thing that I want). Pantone's so grouchy though! I want the eyelash curler so baaaaaaad. Love your blog too! Keep it up! I kept you in my blogger blog feeds because you have the grandest ideas! Backlinked you several times already I think. Apparently at some point Pantone figured out that non-artists didn't know they existed and now they are doing anything for a buck. However, one would think they would back off when there is free advertising. Obviously whomever they hired to track this stuff down wasn't required to use common sense. I have NEVER felt the need to buy any of their stuff. Frankly, I think most of it is tacky. Orange sure is in this season. I've been seeing orange-toned red lipsticks too.